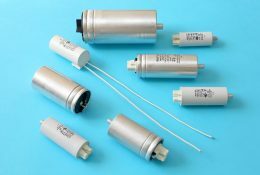 etallized polypropylene film capacitors used in discharge lamps for power factor correction (parallel or series compensation), manufactured in either aluminium case (with overpressure protection device) or plastic case (at request with thermal fuse). Compliant with the European standards EN61048 and EN61049. 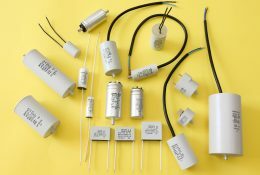 Several types of self-healing capacitors, manufactured using a self-extinguishing plastic or aluminium case filled with resin, for use in single-phase electric motors and in all general a.c. applications at 50/60Hz. Compliant with the European standard EN60252. They have very good reliability and safety performance. These bipolar rough-foil electrolytics are encapsulated in an aluminium can. Their design is very compact. In order to obtain maximum resolution speakers have to be able to follow the music signal also in smallest details and in real-time. But because the capacitor needs a fi nite time, which is proportional to its capacitance, for charging the physics can be circumvented by connecting a small capacitance, also called bypass-capacitance, in parallel to the large capacitance. This small high quality bypass capacitor tracks every single peak and detects now the most subtle ramifi cations in the audio signal. 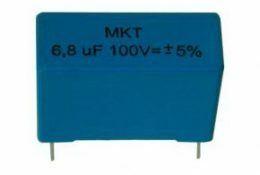 MKT AXIAL METALIZED POLYESTER-FOIL CAPACITORS.